Real Estate Broker Tom Schwenk is launching his own company, Tom’s Galveston Real Estate, in January 2018 to make it easier for people buy, sell and lease Galveston. Tom says Tom’s Galveston Real Estate will be a boutique real estate company that provides unparalleled customer service to both residential and commercial clients wanting to buy, sell and lease single family homes, condos, apartments, multi-family properties, commercial buildings and lots in Galveston. “Tom’s Galveston Real Estate has a wealth of current listings. As the most prolific in-town realtor in 2017 as per the Galveston Association of Realtors, it shows that people come to me because they know no one works harder than I do for my clients and I provide exceptional customer service. Tom is also well known for his knowledge of the real estate industry and the strength of his relationships with lenders, title companies, property managers and contractors. 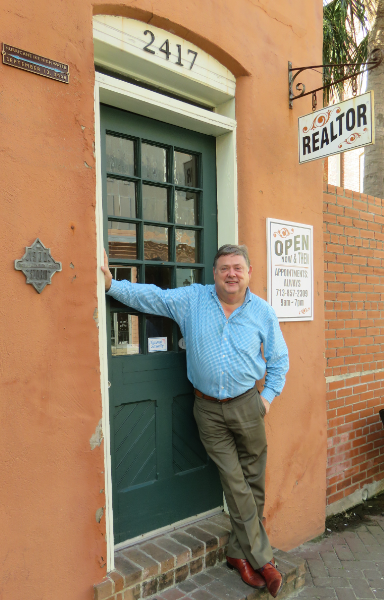 In addition, for people wanting historic homes, Tom brings many years of expertise buying and selling historic homes in Galveston’s East End and Midtown neighborhoods. He is joined by Brian Kuhn and Alex Monteith. All of Tom’s current charity and community sponsorships will continue as will his support of downtown Galveston, Dickens on the Strand, Arbor Day, the Galveston Symphony and other groups. Historic preservation and support of all the non-profits on the island have long been cornerstones of his community support. In recognition of his efforts he was named “Community Hero” by the Chamber of Commerce in 2016. Most recently he was honored at a gala at the Sea Star Base which raised $50,000 for youth, adaptive and community sailing programs. As a NAR Green Certified Realtor® and EcoBroker®, Tom has joined the movement of professionals pushing the market toward energy-efficient, sustainable, and healthier design/features in homes and buildings. A former president of the Galveston Association of Realtors, Tom was named GAR REALTOR OF THE YEAR 2015 and served on the Texas Association of Realtors Political Action committee as its regional representative in 2016. Locally, he is a Landmarks Commissioner for the City of Galveston and is a past President of the Galveston Historical Foundation. He is proud to have been a Paul Harris Fellow of the Galveston Island Rotary Club.